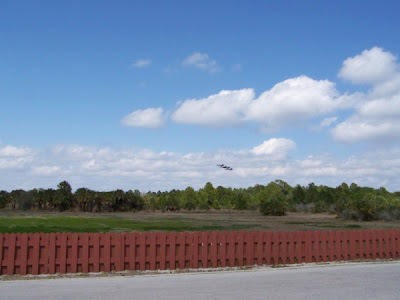 Monday we moved from E G Simmons County Park to MacDill Air Force Base. 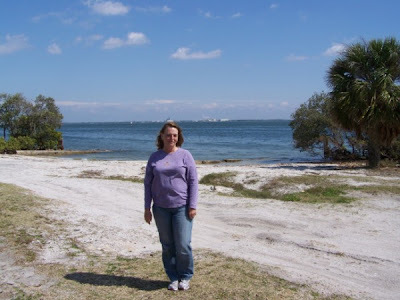 If we walk a few hundred yards to the marina or beach we can look across the bay and see where we were last week, it looks like maybe 2-3 miles across the water, but it was about a 50 mile drive through Tampa to get here. I was a bit surprised when we arrived and found they had empty sites, but it was a welcomed surprise, we thought we would need to be in dry camping a few days before we could get into a site. 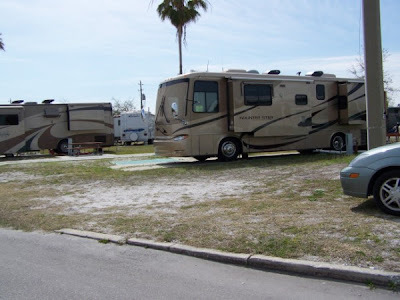 We thought we would take advantage of being able to stay at the Military Fam Camps, since we need to be hanging around the Tampa area anyway. 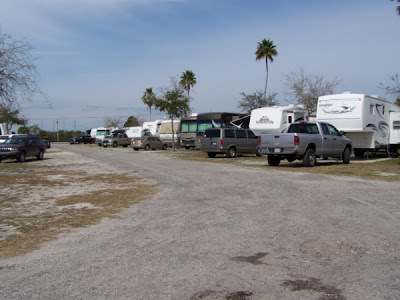 It is also fun being around some of the retired military guys, some think they are still a Drill Sargent running boot camp, but most are just plane old RVers seeking the warm sunny FL weather for the winter. 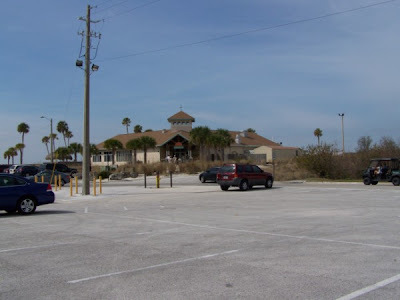 This is one of the "eating places" here on base, we have not been inside yet, and not sure if we will. I've heard too many say it isn't worth the $$ to eat there. 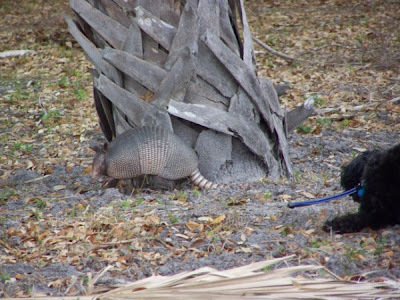 While out walking the other day we spotted this guy holding his dog's leash keeping it from attacking this armadillo. The armadillo wasn't paying any attention to the yapping dog, but he didn't want to pose for my camera either. We have been checking out all the area beaches and banks looking for those "curio worthy" sea shells, but I'm convinced we will need to return to southern FL to find them. 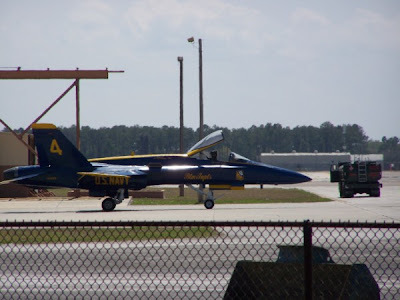 This weekend we will have the honor of watching the famous United States Navy BLUE ANGELS showing off their amazing flying skills. They have this airshow every year so some of the regulars think of it as four days of noisy jets flying way too close to the ground. Since we are not "regulars" we are enjoying the show. Just watching these jets flying through the air so close together, and at such speeds it just gives me a warm feeling all over. 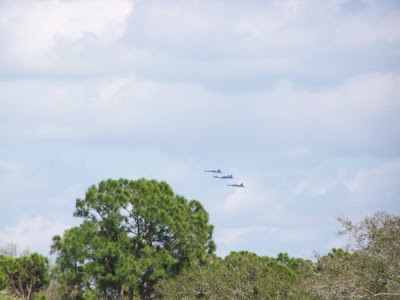 Although I do get a little frustrated when I download my camera to the laptop and see that I have missed the jets in most of the pictures I took. Without a doubt I deleted 5 pictures to every 1 that I saved today. Everyone knows how expensive the digital film is! We did get a message that the Santara was ready for us to pick up Monday afternoon, so Wednesday we made it to Lazy Days to see if it was ready. We caught our service rep out for lunch, and I just couldn't wait for her to return so I ask to speak with her boss. I'm really sure she wishes she had skipped lunch that day! Her boss agreed with us, there was no way anyone inspected the Santara and cleared it to be ready for pick-up, and he assured us he would inspect it before we were notified again.